(HERNDON, VA 10 JULY 2013)— On the evening of Tuesday, July 9, at approximately 7:45 PM. A combination of US Parks Police (an arm of the Department of Homeland Security) raided Adam Kokesh’s residence. Local Herndon, Virginia police assisted in the armed invasion. The officers used a battering ram to knock in the door after two knocks, and did not announce that they had a warrant. Immediately after breaking down the door, a flash bang grenade was deployed in the foyer. Numerous police vehicles, including a light armored vehicle and two low-flying helicopters barricaded Adam’s street. More than 20 armored SWAT team members surrounded the house, as well as a number of detectives, and plainclothes officers. Assault rifles were aimed on all members of the team as they were handcuffed without being told why they were detained. Masked and armored police in full “Storm Trooper” gear flooded in and ransacked the residence. The team was cordoned in a front room, while Adam was pulled aside for questioning. Over the course of the next five hours, the police searched every corner of the house with canine units and blueprints to the house obtained prior to the search. All officers refused to speak to the crew while they we being detained. They confiscated cell phones and personal items with force. Throughout the ordeal, the police repeatedly showed a volatile desire to initiate aggressive, forceful conduct with detainees. At one point, Adam politely requested to use the restroom and was kicked by the officer forcing him to sit handcuffed on the floor. After hours of determined attempts, the safe was forced open and all items inside were confiscated. Adam was arrested and his crew were told he was being brought to the Herndon Police department overnight. Well after midnight, police officers cleared the house. Fairfax County Adult Detention Center has stated that it has Adam in custody. The ADAM VS THE MAN Team will be continuing production on the podcast and the Youtube channel as long as Adam remains imprisoned for an act of civil disobedience. We will continue to spread the message of liberty, self ownership, and the non-aggression principle regardless of the government’s relentless attacks on our operation. We will continue to combat its desperate attempts to crush a worldwide, revolutionary shift in the people’s understanding of the state’s illegitimacy—after all, good ideas don’t require force. When a government has repeatedly and deliberately failed to follow its own laws, violated the fundamental human rights of its citizens, threatened the sanctity of a free press, created institutions intended to eliminate privacy of communication, waged war at the behest of special interests that threatens the public safety, killed hundreds of children with drone strikes, imprisoned and destroyed the lives of countless individuals for victimless crimes, stifled economic opportunity to maintain the dominance of the financial elite, stolen from the people through an absurd system of taxation and inflation, sold future generations into debt slavery, and abused its power to suppress political opposition, it is unfit to exist and it becomes the duty of the people to alter or abolish that government by whatever means necessary to secure liberty and ensure peace. A new American revolution is long overdue. We who recognize the illegitimacy of this government will withdraw our material support. We will take every reasonable measure to avoid the theft of taxation. We refuse to serve the federal government with our labor. We reject the authority of the federal government and will resist at every opportunity. We demand an orderly dissolution of the federal government through secession and reclamation of federally held property. We will provide aid and comfort to victims of the state. We will mark Independence Day not with a celebration of collectivism, but with direct action to create freedom. We will recruit others to this cause and share this pledge. The time to sit idly by has passed, to remain neutral is to be complicit, just doing your job is not an excuse, and the line in the sand has been drawn between we the people, and the criminals in Washington, DC. While some timid souls will say that it is too early, that we can solve this problem through democratic means provided by government, that current levels of taxation are reasonable for the services provided, and that the crimes of this government are merely a tolerable nuisance; it may already be too late. While there is risk in drastic action, the greater danger lies in allowing this government to continue unchallenged. We will not be silent, we will not obey, we will not allow the government to destroy our humanity: we are The Final American Revolution. Not only has Brandon Raub been kidnapped by the government but he has been moved three hours away from his family and isn’t being allowed phone calls until they figure out where they want to put him they being the State of Virginia. I watched the “Fox News Report” and I am not impressed with their reporting. I am thankful that the Rutherford Institute is defending Brandon Raub, a Marine Veteran who exercised his First Amendment rights, his Freedom of Speech. The more I learn about him the more interested I am in seeing him set free. First of all the “special guests” aren’t psychiatrists, and that guy, Fred, he is a former federal prosecutor who had to at some time swear to uphold the Constitution himself! I wonder if he’s ever fought in a war or if any of his children served? It’s no wonder Raub’s mother didn’t trust the Mainstream Media to give her son a fair shake. A little research from the news would have been good! That quote is from a song “Sharpen up my ax I am back, I’m here to sever heads” is from a song called “Bring me Down” by Saigon. I’ve seen thousands of posts of people quoting songs. I know that my own kids have done it. I’ve questioned them. No one questioned Brandon but turned him in? Who turned him in? Who did they receive these complaints from? Did the people complaining go down and fill out the proper paperwork to have Brandon committed? Clearly, they did not. I wonder if these complainers ever met Brandon? Now if they had and had worries then I wouldn’t feel so strongly about my wish for him to be let go! HE WAS ARRESTED FOR RESISTING ARREST! This is nothing but rhetoric to justify the upcoming arrests of more of our troops who question/criticize the government. This is wrong and there is nothing “free” about a country that arrests people for disagreeing with them and their policies. ESPECIALLY when these people WENT TO WAR to “protect our freedom”! Do you support Brandon Raub? Are you free? Can you say whatever you want? Do you really have “freedom of speech” in the United States of America? Are you being watched? Can you be arrested for something you type in the heat of the moment? Can you be arrested for posting lyrics to a song that you didn’t write? The answer to all those questions is YES. You’re free to do all those things but if government officials interpret your postings as a threat they will disrupt your life to detain and study you. Sadly, in America, not only has someone been arrested for posting lyrics to a song that he didn’t write but he has been detained without any referral by friends or family members. Yes folks, big brother can come and take you from your family to have you evaluated. 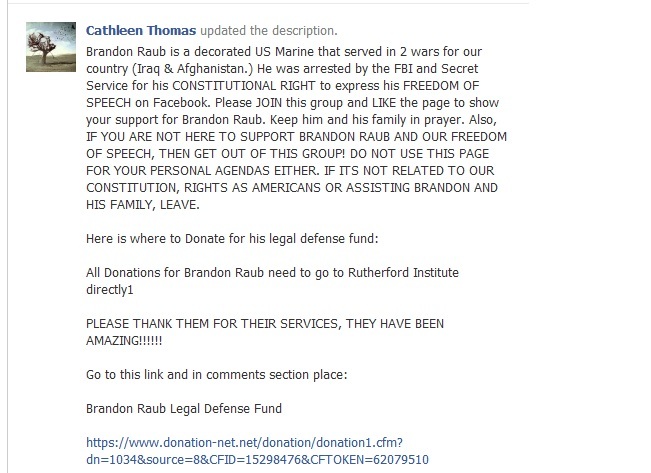 Brandon Raub is a Marine Veteran who served in both Iraq and Afghanistan. 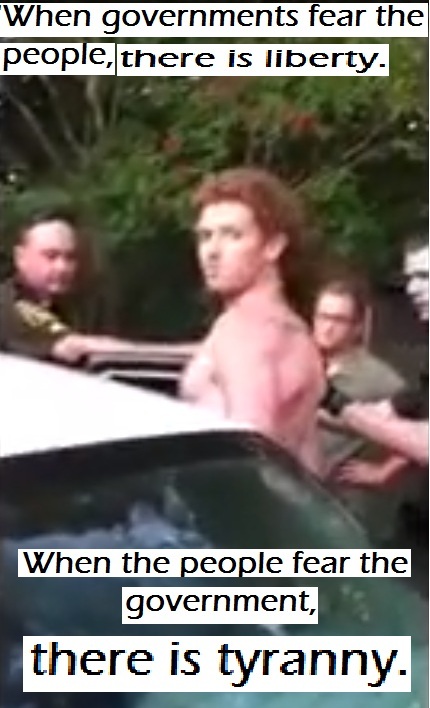 Brandon was recently arrested by the FBI and local police for “resisting arrest”. He is being held for thirty days so that the government can study him and conduct an “mental evaluation” all because they didn’t like what he was saying on Facebook. Where is the mainstream media on this? Well the family clearly doesn’t trust them but they spoke to Adam Kokesh with Adam vs The Man in this exclusive interview. The Rutherford Institute is stepping up and offering Raub legal assistance. The Rutherford Institute, is a nonprofit civil liberties organization, that provides legal assistance at no charge to individuals whose constitutional rights have been threatened or violated. Here is a telephone interview Adam Kokesh with Brandon Raub at the John Randolph Medical Center near Richmond, Virginia. How many other people have been detained for making comments about the government? How many of our vets undergo “mental evaluations” by the government due to their Facebook rants? This is something we should all be alarmed about! There is no liberty. What happened to our Freedom of Speech and expression? Have we lost our way? What are we going to do to get it back? Life is too short to live without liberty!